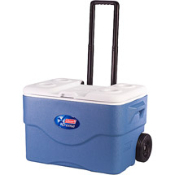 Our 50 quart rental Cooler on Wheels has a hinged lid, retractable telescoping handle and large durable wheels for easy transportation to the beach or pool. Holds up to 84 cans. Colors and styles may vary.